Corporate event planners in Marbella, Corporate event planning in Marbella, corporate event catering in Marbella and much more. We are the leaders in Marbella and throughout the Costa del Sol in planning and catering for various types of corporate events in Marbella and the whole of the Costa del Sol. We can provide canapé menus for any kind of shop opening or new premises. We also cater for office parties, team building days as well as larger corporate events such as symposiums, conferences and exhibitions in Marbella or elsewhere in Spain. We have a large selection of sample menus for catering services in Marbella whether it be for a la carte sit-down meals or for informal buffets, and can also provide all equipment, linens, waiting staff, lighting, sound, staging, decoration, marquees and any other equipment or staff required for your corporate event in Marbella. We have been handling many types of corporate events in Marbella for many years, and in doing so, we have become local experts. Our team of planners work with the best of the best local caterers in Marbella, as well as the most experienced and knowledgeable equipment hire companies in Marbella. If they are not available, we bring our staff and equipment from elsewhere in Spain - to be sure you are not missing anything for your corporate event. In short, we are the corporate event planners in Marbella that you can trust. 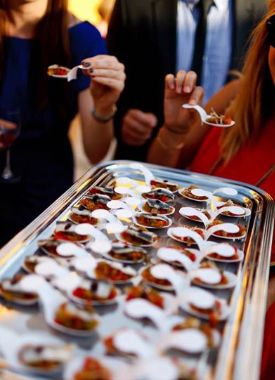 One Events works closely with One Catering for all your corporate event catering in Marbella needs. For more information about the catering services offered, please see: Catering company in Marbella, Spain. Below you will find our most popular corporate event locations over the past 3 years. If you have not already decided on which Spanish city would best suit your requirements, please contact us and one of our representatives will be able to advise you on what would be the best choice for you.